Length: 31" ( back collar to bottom hem ). Short Sleeve Shirt. Type Short Sleeve Shirt. Material Cotton,Polyester. Discover daily new arrivals in all seasons, sizes and styles that you can't find anywhere else. Item Details. Men's HUGO BOSS ORANGE Beige Blue Gingham Plaid Shirt Large L NWoT NEW $145 WOW! Beige with Tonal Blue Gingham Plaid (Note Random Splashes of Red As Well). Hugo Boss (Boss Orange Line). 99% Cotton, 1% Polyester. Button-Front Shirt. 19”(shoulder seam to shoulder seam ). Hugo Boss GREEN Label Collection. Detail Ribbed Collar and Sleeve, Hugo Boss Logo at left Chest. 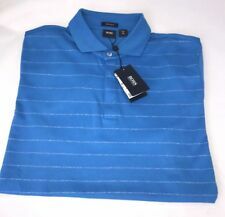 Boss GREEN Label polyester polo shirt. 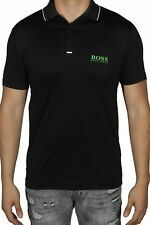 BOSS logo on the left chest, finely ribbed collar and sleeve, 3 buttons with boss engraved, silhouette and the straight hem. 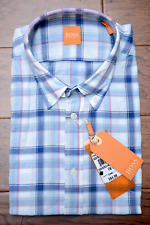 ITEM: EUC HUGO BOSS SLIM FIT CASUAL LS DRESS SHIRT. MARKED 16" NECK, 34/35 SLEEVE AS PICTURED. WIDTH 21.5", LENGTH 30", SLEEVE 34/35", NECK 16". · COLOR : RED WHITE BLUE THIN STRIPES. 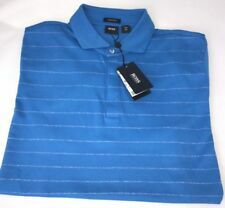 EUC Hugo Boss Mens Short Sleeve Polo Size XL. Regular $125. Condition is Pre-owned. Shipped with USPS First Class Package. Thanks for looking and if you have any questions please feel free to message me. Hidden Button front closures. Chest patch pocket. Machine wash. Long sleeves with button cuffs. Style: Polo. HOPE TO SEE YOU SEEN AGAIN! Sleeve Length: Short Sleeve. Model: 50389103 10201899 01. Product Subtype Clothing: Shirt. Outer Material Type: Cotton. Hugo Boss Orange Label. Australia, Israel, Belgium, Italy, Brazil, Latvia, Canada, Lithuania, Croatia, Luxembourg, Denmark, Malaysia, Estonia, Malta, Finland, Netherlands, Norway, France, Turkey, Poland, New Zealand, Germany, Portugal, Gibraltar, Singapore, Great Britain and Northern Ireland, Spain, Hungary, Switzerland. Color Grey. Button-up Long Sleeve Shirt. Type Button-up Long Sleeve Shirt. Material Cotton,Polyester. Discover daily new arrivals in all seasons, sizes and styles that you can't find anywhere else. Item Details. 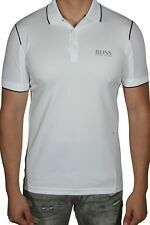 HUGO BOSS SHIRT. A: Arm pit to armpit: 22". C: Sleeve Length Center of collar to cuff: 35 1/2". EXTRA BUTTON. Material: 81% Cotton 19% Polyester. Chest: 21". Length: 30.5". PICTURES WERE TAKEN FROM THE ACTUAL ITEM UNLESS SPECIAL INDICATION! We constantly have new inventory coming in. Top to bottom 31". Sleeves 27". Why Buy From FindYourFashion?. Multiple high resolution photos. "Bottom Size" is the Waist. "Inseam" is the Length. If not received, an Unpaid Item Case will be initiated.